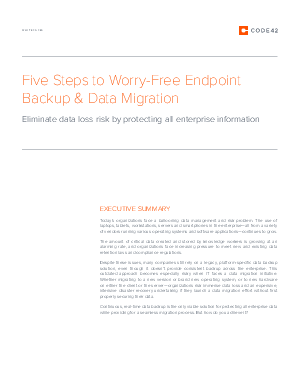 Eliminate data loss risk by protecting all enterprise information. Today’s organizations face a ballooning data management and risk problem. The use of laptops, tablets, workstations, servers and smartphones in the enterprise to create and store critical data is growing at an alarming rate. Many companies still rely on a legacy, platform-specific data backup solution, even though it doesn’t provide consistent backup across the enterprise. This outdated approach becomes especially risky when IT faces a data migration initiative. Whether migrating to a new version or brand new hardware on the client or server—organizations risk immense data loss and an expensive, intensive disaster recovery undertaking if they launch a data migration effort without first properly securing their data. Continuous, real-time data backup is the only viable solution for protecting all enterprise data while providing for a seamless migration process. But how do you achieve it?